This week some of our local actors dressed up in period costume to play the part of dead people. Appearing from behind trees or rising up from behind gravestones in the Valhalla Cemetery, the actors became some of those long dead, telling their stories in the dark of night. One was a Civil War veteran, another a gangster, another a woman who murdered her millionaire husband. Members of the local writers guild researched nine chosen interred with the help of the genealogical society and penned 8-minute narratives for each. They tried to capture not only history, but the personalities of their subjects. Some were able to interview family members. Audience reaction was good, and some families even requested their deceased relatives be included in next year’s Voices of Valhalla. “I guess everybody has a story,” said one guest. 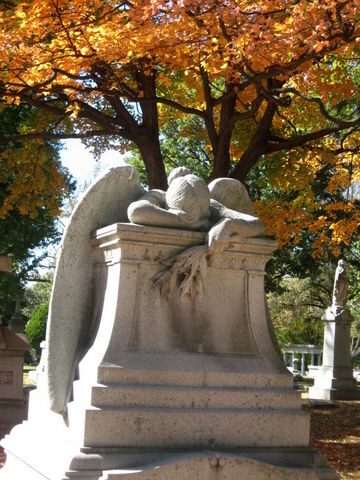 “It’s a different way to look at a cemetery,” said another, as reported by the St. Louis Post Dispatch.